john spends christmas at the airport, and stumbles into a merc plot to hijack the airport control tower in order to rescue a drug lord general that's being delivered to US authorities. his wife in the meanwhile, is on a plane circling the airport and will run out of fuel in a couple of hours. hence he gets up close and personal with the general and his mercs. i'm an action blockbuster fan and this is an action blockbuster of the finest order. in case you didnt realise it, the action is 2x as hard to make as the first time round, cos its filmed in freezing conditions. the usual die hard reasons. bruce is funny and gives as good as he gets. plus some of the twists and turns in the plot are really good. the special effects too. 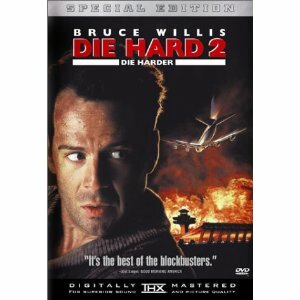 in fact, it makes you wanna go watch die hard again.